The Roman Baths are Bath’s greatest claim to fame, and gave the city its name. The steaming hot water rising from the ground here is the only thermal spring in Britain. The waters were known and used by local tribes long before the Roman conquest of Britain, though their setting would have been much more humble. The cultivated Romans, however, had no intention of paddling in muddy springs or ponds. They began big developments around the thermal springs, building a reservoir to capture water, a temple and a lavish complex of baths, changing rooms and public spaces of the sort they were used to in the rest of the Empire. The temple here in Bath was dedicated to Sulis Minerva, the conflation of Roman goddess Minerva with a local deity (the Roman name for the town was Aquae Sulis). A gilt bronze head of the goddess survives and can be seen in the museum at the Roman Baths, along with other fragments of sculpture and mosaics. The Roman Baths museum is well-planned and a good audio-guide with a choice of commentaries is included in the entrance price. This helps visitors to put the site into context, and to make sense of the different buildings you are seeing, which include original Roman features, buildings from the later Georgian heyday of Bath, and nineteenth-century additions, such as the terrace above the Roman Great Bath, the first stop for visitors. Although bathing continued to be popular in Bath, the Roman ruins were lost for centuries. Nineteenth and twentieth-century excavations uncovered the lead-lined Great Bath, where the current colonnades and terrace were constructed on top of the Roman lower levels, and other parts of the Roman bathing complex, which are underneath later buildings. Back in Roman times, the Great Bath was covered and its waters would have been clear – the greenish colour today is caused by algae reacting with sunlight. Passing down into the depths of the museum, you work through exhibits illustrating the long history of the site. Archaeological finds on display include Roman tombstones, statues and many votive offerings and curses which were thrown into the Sacred Spring for the gods. The translations of these curses are fascinating; generally disgruntled citizens calling down vengeance on whoever stole their valuables. Walkways pass over and around excavated Roman ruins, with video reconstructions to help visitors picture the temple complex. 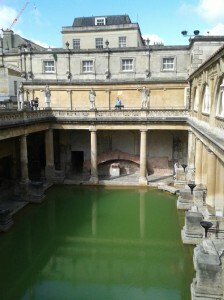 After circling the steaming waters of the bath – visitors can also view the other baths used by the Romans, who liked a series of different-temperature dips. The museum visit ends with the chance to drink the spa waters. Once, Bath’s health-conscious visitors queued up in the Pump Rooms for this opportunity. It’s rather nasty and metallic-tasting, but taking a sip is all part of the Bath experience. The entrance to the Roman Baths Museum is just outside the Abbey in the centre of Bath. Admission is fairly expensive, although the attraction is worth it. Combined tickets for the Baths and Bath’s Fashion Museum are available, and there are various reductions for senior citizens, students, Art Pass-holders, families and children. To get the most from the museum, you should allow 1-2 hours for your visit. The museum is open every day of the year except 25th and 26th of December. In July and August the museum is open until 10pm (last admission 9pm) so visitors can enjoy evening visits to the torchlit baths.